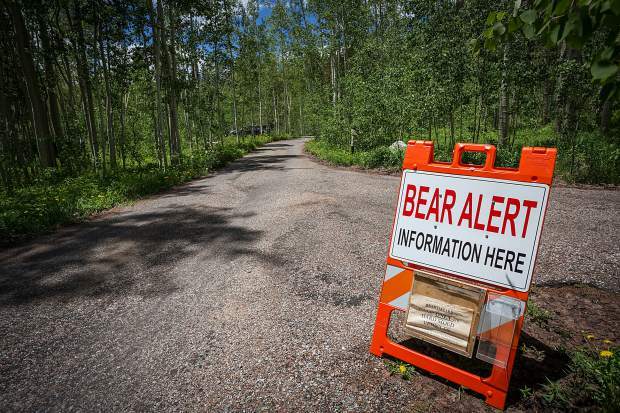 A sign warns campers at Weller Campground of bear hazards, and the need to only camp in hard sided vehicles and campers. GRAND JUNCTION (AP) — It’s a busy year, but a bear-able year so far, for Nanci Limbach’s wildlife rehabilitation center southwest of Silt, where bringing up young bruins and getting them back where they belong can be a big part of the job. But with several weeks left to go before bears go into hibernation and conflicts with people come to an end, she’s waiting to see how the rest of the season plays out during a year when the animal’s natural food sources have been less than bountiful and the temptation to seek out what humans eat can become great. She’s seen worse years — a couple of years ago the center had 26 bears in its care. But even a dozen can require a lot of time, not to mention food, from the bears’ caretakers. Limbach has earned the right to say that after decades of working — for no salary — to deal with bear problems that often are of humans’ making. That can be thanks to things like failure to secure food and garbage sources so bears stay in the woods rather than coming to town and finding trouble. Human-bear encounters can be dangerous for humans, but generally even more so for bears. Colorado Parks and Wildlife personnel tag bears that cause problems, and typically euthanize them if they repeat such behavior. Even a first-time offending bear can end up having to be killed if agency officers feel it can’t be rehabilitated or relocated, or poses an immediate threat. Local CPW spokesman Mike Porras said this year “has been a very active bear year” in the CPW’s northwest region. He said this year hasn’t been as busy as 2014 as far as bear issues in the region, but generally speaking, bear-human conflicts have increased over the years, and it’s important for the public to educate themselves about actions they can take to protect not only their families and neighbors, but the bears. That’s because if bears get into garbage, birdseed and other human-related food sources, it can end up being a death sentence for them. “It’s our officers who have to carry out the execution,” which can be the worst part of their jobs, Porras said. He said when possible, CPW works with rehabilitation facilities like Limbach’s that endeavor to eventually release bears back into the wild, “and they do great work.” But rehabilitation isn’t always the answer. “A bear has excellent memory. Once they are rewarded with food it’s very difficult to break them from that habitat,” he said. Limbach said that for the most part, her center works with young bears rather than adults. Perhaps the mom was a problem bear that had to be euthanized, or maybe it was struck by a vehicle or died from unknown reasons. Her facility’s job becomes to feed the young bears — often relying in part on volunteers who gather up locally grown fruit — and to fatten them up for winter, all the while minimizing human contact with them. The center then releases the animals once the first big snows hit, and they hibernate in caves, under rocks or in other sheltered spots and then hopefully go on to be bears out in the wild. “It’s nice to see them get back out where they’re supposed to be,” she said. She fondly recalls the release of a bald eagle this April at the Tilman Bishop State Wildlife Area in Palisade. The bird had been shot at Corn Lake, and was fixed up by Fruita veterinarian Paul Bingham before going to Limbach’s center, which works closely with Bingham. The center is able to do physical therapy and other work even with big raptors, thanks in part to a $98,000, 100-plus-foot-long flight cage that Limbach recently built through the generosity of donors. “He’d go flying up, then he’d just tumble and turn almost like he’s crashing to the ground, and then he’d catch himself at the last minute and then he’d soar back up. It was the coolest darn thing,” she said. “I was the neighborhood kid that if somebody hit a squirrel, it went to Nanci,” she said. She’s run her center for 35 years, and she said it’s licensed to basically take all kinds of species. It’s one of just three rehab centers in the state that is licensed to handle large predators, such as bears and lions. Limbach’s center doesn’t get state funding but instead relies on donations — meaning everything from money, to leftover frozen elk meat that satisfies meat-eaters such as bobcats living at the center. In return, the center not only helps animals but also does educational work, hosting visits from schoolchildren and teaching college vet-tech students how to work with wild animals. Some animals — such as the bobcats, which had been declawed when they were previously owned as pets, and a fox that’s too habituated to humans — will live out their lives at the facility. “I think it’s great having Nanci here. For us, there’s always an option to take a critter” to the center. Young fawns, squirrels and other creatures that likely still had a mom around get “rescued” and delivered to the facility. A calf elk now recovering at the facility was saved when someone fired a gun in the air to scare off a bear that the person saw attacking the young animal. While Limbach recognizes the good intentions, she also points out that the intervention meant a bear didn’t get a meal that it would have if survival-of-the-fittest nature, however cruel, had been allowed to prevail. As can be the case when it comes to other wildlife issues, oftentimes when it comes to bears being attracted to communities, “it’s a people problem,” Limbach said.